This month our Spotlight is on a very busy woman. If we gave away an award for “Fun, Fearless Female” this woman would definitely be our choice. 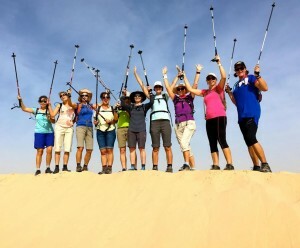 When she is not busy with her family or volunteering as chairperson for the American Women’s Network, she can be found hitting the sand dunes training for the Women’s Heritage Inaugural Walk which takes place next month. Those who have met her know she is an absolute blast to be around. We are kicking off our 2015 Spotlight Series with one of our favourite housewives, Denise Schnitzer. What do you consider your greatest professional achievement? Being a teacher/mom/writer. Do you have children and have they influenced your career? Yes, two daughters: Emily 20 yrs old and Tara, 19 yrs. old. They are my greatest joys and accomplishments. How do you stay connected through social media? I check Facebook and email daily. What profession other than yours would you like to attempt? I love my life and wouldn’t change a thing! I’ve been a teacher in many capacities and I love that I learn and teach everyday. How do you maintain a work/life balance? Google Calendar and bubble baths. What websites do you visit every day? Facebook, Gmail, my blog www.alohadenise.com and Ellen.com. Who is your hero and how have they helped make you who you are today? My parents are wonderful role models and heroes for me but my husband (of 30 yrs) is my true hero. What are your top 3 favorite people/places/things in Abu Dhabi? I love Manarat Saadiyat, Sir Bani Yas Island and my new favourite place is walking in the sand. I am part of the Women’s Heritage Walk 2015, an inaugural walk from Al Ain to Abu Dhabi (140km) beginning Feb 1st. That is my newest hobby and I love it. What is your goal for retirement? I will never retire: there’s too much to see, do, eat and explore! Do you have any advice for women who would like to start their own company Abu Dhabi? I write a blog that posts on odd days, because I’m kind of odd, but it’s not a business. It’s FREE. It started when I moved to Honolulu, HI. 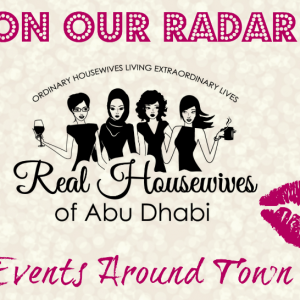 I expanded it to include places to go, shop, explore and I’ve brought it to Abu Dhabi in the same vein. I love to teach what I’ve learned and share the joy! How did you come up with your idea to start your blog? I was sitting on a city bus and I saw a lady wit a yellow shopping bag filled with scallions. I asked her where she bought them and she told me and pointed to the store. I found a wonderful grocery store and began my journey of finding and sharing that day. You keep busy as a blog writer/Coffee Chair for AWN/parent volunteer/wife/mom. How do you overcome challenges? Take a bath every week with lavender bubbles! What would you do if you knew you couldn’t fail? I know that failing is part of living and every time I fail, I move forward. I just play full out and in color and have FUN everyday!